It's been three years since I've read Every Day. I've read many books since then, which helped me read Another Day with fresh eyes. In the first book, we met A, a soul who wakes up in a new body every day. A falls in love with Rhiannon and tries to find a way to make it work. 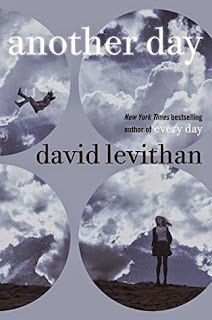 David Levithan's newest novel tells the same love story from Rhiannon's perspective. In the sequel, we get to see more of Rhiannon's life, which she has shrunk to suit her difficult boyfriend, Justin. Her best day with Justin was really when he was inhabited by A. While the story on A's side is fairly straightforward (must find Rhiannon, must declare love), Rhiannon has a life and entanglements that are more difficult than A can understand. Although I vaguely remembered what happened, I wasn't able to put the book down. I spent the day reading, wondering where it would leave us and what would happen to the couple. The end was a combination of satisfying and desperation-inducing--I want more! David Levithan is one of the best authors for YA readers, hands down. I love how these books challenge our idea of a typical romance and have me rooting for A and Rhiannon to find a way to make it work.